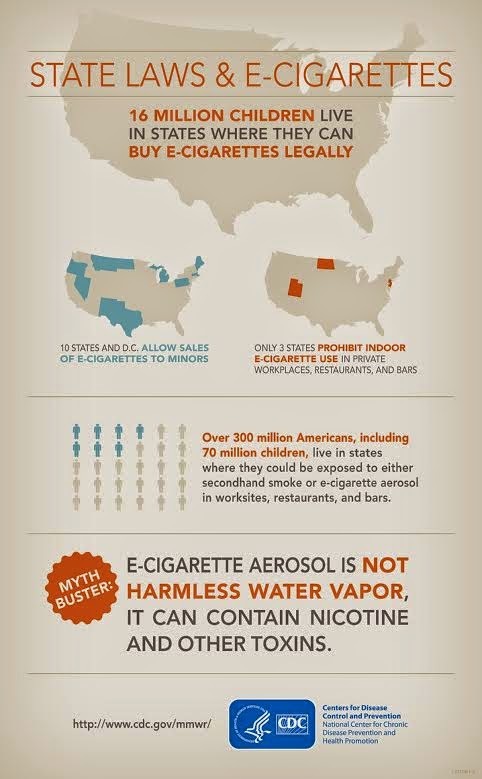 Forty states have enacted laws prohibiting the sale of electronic nicotine delivery systems (ENDS), including e-cigarettes, to minors, but 10 states and the District of Columbia still permit such sales, according to a report published by the Centers for Disease Control and Prevention in today’s Morbidity and Mortality Weekly Report (MMWR). More than 16 million children aged 17 and under reside in states not covered by these laws. The latest data from the National Youth Tobacco Survey showed 4.5 percent of all high school students and 1.1 percent of all middle school students had used e-cigarettes within the past 30 days in 2013.